How romantic is this setting? I am not sure she is in the best outfit for climbing ladders in an orchard but she gets away with it. The day after I saw this image in the December issue of Australian Country Style I found two near identical industrial ladders! They have very similar red paint. Very decorative. I must confess, I do have a thing for ladders, but you may have already worked this out? This wooden and metal folding cafe chair is very similar to one that we found recently. 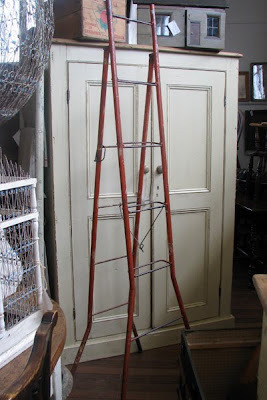 I don't think I have ever seen one of those industrial ladders 'in the flesh' before....mmm yes, would be a bit of a brute to get tangled up in those layers of white!!! LOL. I am seriously in love with cafe style chairs. Mind you, I only have two, but it's a start. 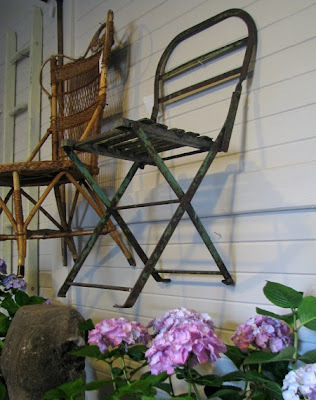 The hydrangeas in your garden room look gorgeous. I'm waiting for mine just a little longer before I bring them in as cut flowers. the blogs looking good! looks like a total success. i love how the Drill Hall stock items that's shown in some magazines. Oh Tammy, such a lovely blog you have here. I was told how lovely the Drill Hall was by a couple of friends of mine and I was astound today when I came in today. It's lovely to ser by how every everything set out and you can just go through looking at things without feeling claustrophobic. Great shop and credits to you and everyone else that works up at the Drill Hall.